When we partner with companies to give them a quality corporate wellness program, they often ask how to get their employees involved. Though every corporate wellness program has many facets, one of the most useful components is corporate wellness challenges. Uniting for a common purpose or goal has helped people of all types come together throughout history and accomplish something great. Your company can follow in the footsteps of others, get employees excited, and see real results. · WellTrek Virtual Pedometer Challenge: take a virtual tour throughout the country using our interactive pedometer program. · Wellness Passport Challenge: complete weekly healthy habits and map your success throughout the challenge in your passport. · King of the Hill Challenge: complete various walking activities to work your way up the mountain. Each challenge mentioned is also customizable – it can be 8 – 12 weeks long. They can be individual or team challenges. Employees receive weekly reminders and tips. This is just a sample of the types of corporate wellness challenges that you could offer your employees. There are several benefits to incorporating corporate wellness challenges into your wellness program and daily life in the office. Wellness challenges promote teamwork and get people talking about wellness. You can set up challenges to be individual or for small teams. Challenges get employees engaged in the wellness program, which is one of the keys to successful wellness. Challenges are fun and effective. They help employees maintain regular physical activity, push themselves beyond their normal boundaries, keep them motivated and boost healthy eating. If you’re interested in implementing corporate wellness challenges into your workplace, contact Wellworks. 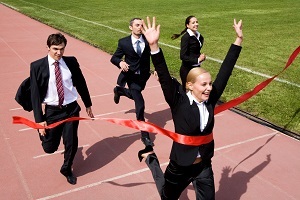 You will need to first start a corporate wellness program for your business. Wellworks can walk you through the process and get you all set up. A wellness challenge is just one aspect of a corporate wellness program. Most companies try to do wellness programs on their own, but they lack the time and knowledge to implement them well. A successful wellness program is holistic – it’s not just about losing weight but it focuses on helping all employees become more balanced and healthier individuals. Check out our website to find out more information.